Eurocom Corporation (www.eurocom.com) a leading developer of long lifespan, fully upgradable notebooks, high performance mobile workstations, All-in-One desktops and mobile servers is announcing support for the Killer™ Wireless-N 1102 high-performance wireless network adapter as another available wireless card option in Eurocom systems. 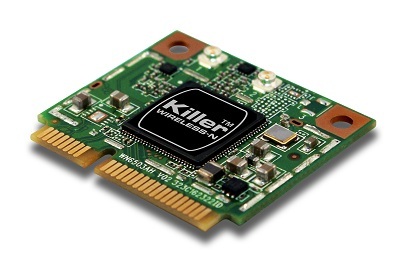 The addition of the Killer Wireless-N 1102 adapter by Bigfoot Networks gives Eurocom customers an ultra high-performance wireless card for their custom built notebook. “High performance mobile solutions are built on the performance of their individual components like Processor, Memory, Video as well as connectivity. So we are looking forward to offering our customers the Bigfoot Networks Killer™ Wireless-N 1102 high-performance wireless networking adapter in our Mobile Workstations and Performance Business and Gaming Notebooks,” said Mark Bialic, President of Eurocom. •	Speed - Killer Wireless-N 1102 high-performance wireless networking adapters are designed for blazing fast performance, up to five times lower latency than the competition. Faster downloads, smoother online gaming and better streaming video are now possible with advanced 802.11n technologies and exclusive Killer™ networking features. •	Intelligence - Killer Wireless-N uses exclusive Advanced Stream Detect™ to automatically classify and prioritize latency-sensitive network traffic for online games, HD video and high quality audio for better quality and fewer interruptions in your online experience. •	Maximum Control - See which applications are hogging your wireless bandwidth. Set limits using Visual Bandwidth Control™ or shut them down completely with Application Blocking, so they don’t interfere with your online games or other multimedia applications. Eurocom is a leading developer of mobile computer technology since 1989. The company has produced many firsts and continues to engineer VGA solutions that inspire and enable individuals and companies to reach great possibilities. Eurocom has been a leading innovator in the mobile computer industry since 1989, is currently the only developer in the world offering a Server on the Go solution along with a full line of Mobile Workstations, RAID 01/5/10 with up to 4 hard drives. For more information on Eurocom please visit (www.eurocom.com). Bigfoot Networks delivers the fastest, most intelligent networking solutions designed to improve the way people enjoy the Internet. The Company’s hardware and software products deliver a smooth, uninterrupted consumer experience for online games, streaming HD video and real-time communications. Bigfoot Networks is a privately held company based in Redwood City, California and Austin, Texas. To learn more, visit Bigfoot Networks at http://www.bigfootnetworks.com.